DO YOU BELIEVE IN THE POWER OF FEMALE VOICES TO CHANGE THE WORLD? And do you think sport is a catalyst for change and dialogue? 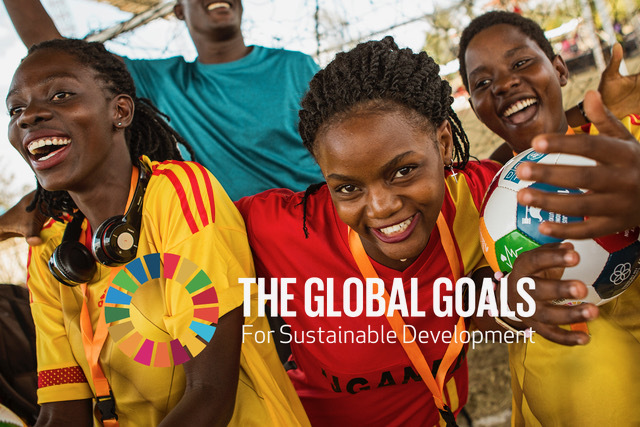 If you answered yes then we invite you to take part in the 2018 South African Global Goals World Cup! On October 13, 24 teams from across South Africa and abroad will converge in Johannesburg to take part in the first South African Global Goals World Cup. Teams from local qualifier tournaments in Limpopo, Kwa-Zulu Natal, The Free State and Gauging are already preparing to make their way to Johannesburg in October to play against YOU! A Global Goals World Cup team consists of any 5-8 women aged 13 and up. You can represent an organization, a company, a country or just yourselves! To enter, you must be available to be in Johannesburg on October 13 2018. Unless otherwise indicated by the organizers, teams must cover their own travel and accommodation. To play in our tournament soccer skills are optional, but passion for sustainable development is mandatory! Crowd engagement, taking action for the SDGs as well as your original team style will all be counted as you score points for change! Goals World Cup is the first ever activist world cup for amateur women. The Global Goals World Cup is the initiative of danish non profit sports organisation Eir Soccer. It is a global women's amateur football championship for the UN SDG's (Global Goals). Eir soccer works locally with strong partners across different sectors to combine global scale with strong local impact. The Global Goals World Cup South Africa is hosted by Save the Children in association with the Royal Danish Embassy and the Embassy of Ireland.